Priceline’s Name Your Own Price feature can be a very effective way of booking cheap travel. But if you do a few easy extra steps you’ll be able to use this feature to increase the odds of knowing what hotel you’ll win, and to decrease the cost you’ll pay. In the past I used this method to book the Lodge Renaissance Sonoma Resort and had confidence I would get that exact hotel at around $100 a night. 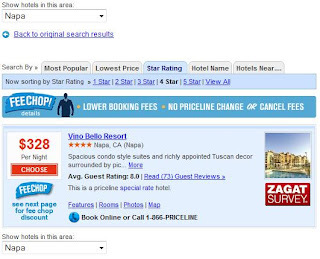 The first step is to navigate to Priceline search for hotels and view the cities by star rating category in your area for hotels. The objective here is to find a category where there are very few hotels to select from in a star rating category. By selecting a star rating category in an area with few hotels, this will help narrow down the possibilities of hotels for your winning bid. Example: I choose Napa, California. The Napa, CA area only has 1 category 4 star hotel, the Vino Bello Resort. By using this location in Name Your Own Price I can narrow down my chances that I will get this hotel if I place a winning bid. The Resort is selling for $328 on the regular priceline hotel results page. But we can do better than that using Name Your Own Price by just a few more steps. Biddingfortravel.com is the site you will want to use to check out what recent winning bids are going for in your area. Navigate to the location you found on Priceline and see what the winning bids are going for. Example: In Napa, CA the 4 Star hotel is selling in a range of $80-$95 based on prior winning bids. That is around a $250 savings off the advertised priceline price. So based on other traveler’s experience you can narrow down your bidding range to $80-95, always start low. Keep in mind winning bids are affected by dates, and how far in advance one books. Once you win make sure you come back to this location and place your winning bid so others can benefit from your experience. Now that you have (1) Found a location with a limited number of hotels to choose from, and (2) know what the winning bids have been going for, place your bid using Priceline’s Name Your Own Price. In my example I would start with a bid under $80 in case the previous bidders were too high. Then you will be notified whether you won or not by email. If you did not win simply wait a day, re-check Better Bidding, and re-bid within the range for that area. If you did win, drop us a line and let us know this helped, we always appreciate feedback. Priceline’s Name Your Own Price is a great feature to get great hotels at low prices. To increase your chances of scoring that hotel you want at a low price check out what other people have done over at Better Bidding.